Two or more people sharing a ride in a car constitutes a carpool. Carpooling is a type of ridesharing that tend to be an informal arrangement. What are some of the benefits of carpooling? If you carpool in the Dallas area, you are eligible to travel on the High-Occupancy Vehicle (HOV) lanes, which enables you to avoid rush hour slow-downs and reduce travel times. Currently there are HOV lanes open on IH 30 (East R. L. Thornton Freeway), IH 35E (Stemmons Freeway), IH 635 (LBJ Freeway), IH35E (South R. L. Thornton Freeway), and US 67 (Marvin D. Love Freeway) (see map). More details are provided on the Dallas Area Rapid Transit (DART) website. Carpoolers can use one car owned by one driver. The riders and driver agree to an amount paid periodically to the driver, to cover operating costs for the daily commute. Carpoolers can rotate car use so that each person's vehicle and driving time is shared equally. No money is exchanged in this arrangement. Carpoolers can also make arrangements to meet at park-and-ride locations to begin their shared ride. There are several park-and-ride locations throughout the Metroplex. There are 31 park-and-ride locations within the DART service area, making it easier to use DART transportation services. There are five park-and-ride lots within the T's service area, three within DCTA's service area, and three in the City of Arlington. Finally, the TRE has park-and-ride lots at six of its rail stations. How can I start a carpool? 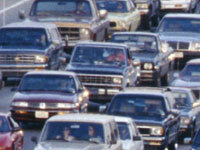 If you are interested in carpooling, check first around your neighborhood and your worksite. You may find someone who works and lives close by and works similar hours as you. If you can't find anyone this way, you can create your own profile at www.tryparkingit.com and instantly find carpool matches in the Dallas-Fort Worth region. You may also contact one of the region's transit agencies which offer professional rideshare matching services. The transit agencies are Dallas Area Rapid Transit (DART), the Fort Worth Transportation Authority (FWTA), or Denton County Transit Authority (DCTA) . (817) 336-RIDE, or DCTA at (940) 243-0077.